Things you should do over the holidays: give to charity, be nice to strangers, maybe get grandma a nice Christmas gift. Things you need to do over the holidays: race through the streets in a Speedo, pound drinks in a Santa suit, eat bunch in your pajamas. Life is all about distinctions. Here’s everything you need to do in Chicago over the holidays. The German-styled outdoor Christmas market once again sets up shop in Chicago, and you should pay a visit at least once for a quick infusion of holiday cheer. Get an early jump on the action at the Twas the Night Before Christkindlmarket event November 15. This local Christmas tradition involves a massive display of twinkling Christmas lights, live ice carving, kids’ games and, of course, spiced wine and beer. Special events include a holiday market November 27 and BrewLights craft beer fest on December 6. 101WKQX’s annual “The Night We Stole Christmas” concert series kicks it up a notch this year with live performances over four nights from Smashing Pumpkins, Death Cab for Cutie, Walk the Moon, Nathaniel Rateliff, and more. Join another raucous crew of boozed-up holiday revelers in partially stained Santa suits as they crawl the downtown bar circuit and freak out plenty of confused tourists along the way. Stop in between bars for caroling on the steps of the Art Institute and a photo takeover at the Bean. Run around the lakefront outside Soldier Field with Christmas music, cookie and candy stations along the route, and an after party at Navy Pier. Santa hat and beard included; funds raised for charity. The name pretty much says it all. And, hey, at least it’s for charity; 100% of proceeds go to the Chicago Diabetes Project. They’re all there: eggnog, holiday mules, jungle juice, spiked hot chocolate, mulled wine, winter mimosas, and more. Imbibe a few and then get chatty with your newest holiday crush. Shop where the cool kids shop at this indie maker’s paradise with hipster-approved handmade goods, local DJs, workshops, food trucks, and booze. Learn essential skills during classes on subjects like wreath and ornament making as you sample locally made artisan foods, fashions, home goods, and art in a trendy warehouse space. Screw The Nutcracker. 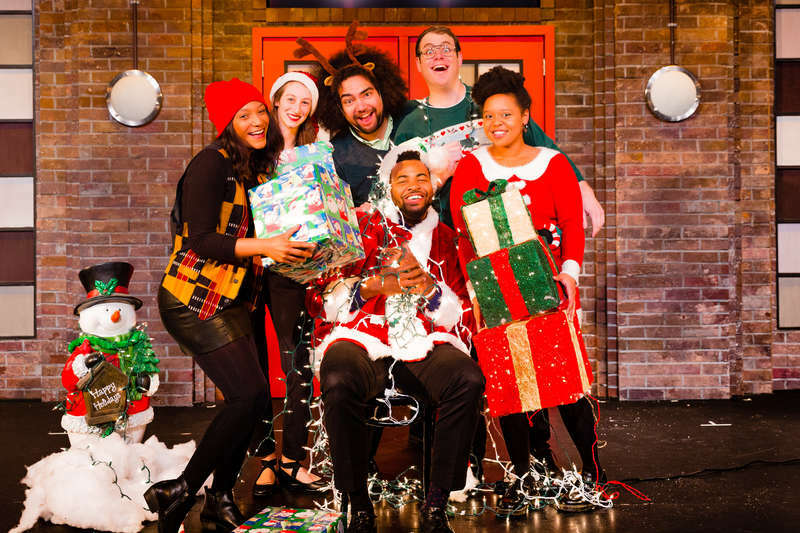 The real holiday musical in Chicago is this Christmas-themed Die Hard parody, this year being held in the hip confines of Wicker Park’s Den Theatre. Do we smell date night? Joe’s is transformed into the North Pole-themed Macy’s store from Elf at this annual toy drive event going strong until 5 am, with live yacht rock from appropriately named band The Ron Burgundys. This holiday-themed crawl around Old Town includes $3-$7 tasting options at participating establishments and a “holiday plate” for collecting stamps at each location to win prizes. And, yes, there will be plenty of silly photo props so you can show everyone how much fun you’re having. If you’re going to attend one massive over-the-top NYE celebration, it might as well be this long-running rager sprawling out across five ballrooms at the Drake Hotel. Only one question remains: Is 40 bars enough? One of Chicago’s best new bars hosts good-time DJ extraordinaire RJD2 performing with a full band for a show that seems a more than appropriate way to end this dumpster fire of a year. Other NYE shows to check out include Guided By Voices at Bottom Lounge, The Hood Internet at Subterranean, and Bully at Empty Bottle. Roll out of bed in your PJs and head to West Loop craft brewer Haymarket Pub for the cure to what ails you: a massive brunch spread with Bloody Mary bar and ‘90s tunes from Uncle Jesse & the Rippers. Jay Gentile is a Thrillist contributor and his Santacon suit is dusted off and ready for action. Follow @thejaygentile.